It was Dr. Muhammad Yunus, a Bangladeshi social entrepreneur and civil society leader, Nobel Peace Prize winner, pioneer of the concepts of micro credit and finance and the founder of Grameen Bank , who initiated the system of granting small loans to poor rural women without collateral and at a low interest rate, repayable by installments enabling them to start up a business of their own as a means of emerging out of poverty. The Grameen Bank that he founded with this object acquired a great success and global recognition. The most important characteristic of this experiment was that it proved the creditworthiness of poor women with 96% of them repaying the loans obtained. Perhaps, it may be after this successful experiment by Yunus that the bankers realised, for the first time, the potential of economic gains in granting loans to poor women without insisting on collateral to initiate small-scale projects. Ironically, the concept of micro credit and micro financing introduced in good faith by its pioneers to uplift living conditions of the poor economically, has, in the hands of micro financing companies in Sri Lanka, become a cruel source of sucking the blood of poor women. This program run by micro finance companies in Sri Lanka of granting loans to poor rural women without collateral can be considered a massive racket of exploiting the poorest of the poor in the rural sector. It is also interesting to note the enormous number of companies engaged in this business and the big competition that exists among them. Evidently, the loans granted to rural women without collateral by micro financing companies are not for investment purposes for them to start up a business to uplift their living condition. Most loans are not used to create small businesses at all; they are used for consumption. Even the repayment capacity of applicants do not seem to have been taken into consideration in granting loans. It is natural and inevitable for the number of the women taking loans to go up rapidly when the loans are granted without having to produce collateral. The only condition applicable for granting a loan has been to have the loan application recommended by two members of a women’s society of which the applicant is a member. There is no system of assessing the repayment capacity and the true purpose for which the loan is taken. Moreover, there is an arbitrary element in the way the fines are imposed when the repayment of instalments is delayed. In this backdrop, it is unavoidable that the poor women get caught in a debt trap and fall into misery when loans are taken unscrupulously, at very high rates of interest and the loan money is used for “consumption smoothing,” leading to increasing indebtedness. Usually, the commercial banks do not grant loans to applicants who had defaulted loans obtained from another bank. But, contrary to this practice in the banking system, the micro financing companies have adopted a policy of granting loans even to those who had defaulted loans taken from another micro finance company, thus enabling the prospective loan applicant to settle the loans taken previously. This reflects the big competition that exists among the micro financing companies to attract more and more burrowers and keep them in their grip. This practice, despite helping the debtors free themselves of the loans taken from one finance company, invariably makes them the debtors of the new company which had come forward to give them loans, creating a scenario that leads to make them victims of a cycle of predatory lending. I came to know of a woman who had taken seven loans from seven financing companies in succession and on each occasion to pay back the previous loan. I got an opportunity to explore the problem of indebtedness of poor women in Polonnaruwa District, who had obtained collateral free loans from micro financing companies and fallen into misery due to being unable to repay them. During a recent visit to Polonnaruwa, accompanied by Jayatissa of Kavudulla, a well-known leader of the disadvantaged people in the district, I had an opportunity to meet the members of three women’s groups in Elahera, Hingurakgoda and Medirigiriya respectively and discuss their problems. About 200 women attended the meeting held at Medirigiriya. The number attended this meeting, we were told, was only a small fraction of the women who had obtained loans. According to them, nearly 80% of families living in the area had obtained loans from micro financing companies. The grievances that they brought to our notice were rather pathetic and shocking. We were told that a leader of a loan group in Medirigiriya had died after consuming poison due to being unable to pay back the loan. It became evident that the methodology adopted by finance companies in giving loans and recovery of instalments is crude and abusive. Each company has employed a team of field officers to issue loans and collect the interest and the instalments. The income of field officers and their job security depends on the number of loans given and the effectiveness of the recovery of instalments. Instalments are being collected weekly or fortnightly, not monthly. The field officers are young men and the debtors they have to deal with are women. We were told the field officers would visit the defaulters and stay in their houses till the outstanding instalments are paid and that the field officers would make these visits particularly at night when their husbands were away from home, in their farms standing guard against the wild animals damaging crops. The fact that the Northern Provincial Council had to issue an order prohibiting field officers visiting residences of debtors in the night to collect loan instalments explains the authenticity and the gravity of this issue. The field officers, we were told, had adopted tactics that can turn into abuse, harassment and manipulation. According to what we heard, they scold the loan-takers in abusive language when they fail to collect loan instalments, often making derogatory remarks, telling them ‘at least sell your body and pay the instalments if you took loans’. Most women had obtained loans merely because the facility was available without having to produce collateral. The loans were not taken to invest in income-generating ventures but to meet their immediate consumption needs. Of course, there were a few who had invested the loan money. But they too had failed to achieve any success due to high rate of interest payable. They don’t seem to have been mindful of the difficulties to be encountered in repaying the loans. Consequently, these poor rural women, who had availed themselves of loans merely because the facility was freely available without having to produce collateral, had messed up their life. It can be said that this problem has also created clashes among family members and disrupted their happiness and harmony. A mother from Vavuniya unable to pay the loan attempted to die by suicide with her children. A woman from the same area provoked by this news threatened to launch a street protest to awaken public opinion on the issue. Minister of Finance Mangala Samaraweera having come to know about this made a public statement on the issue of microcredit loans at Hinguraggoda, which aggravated the crisis further. Apparently, the Minister had assured that the Government would undertake the responsibility of repayment of loans and requested the people who had obtained loans from microfinance companies to refrain from paying them. Consequently, even those who had been paying the instalments had stopped paying them. However, only a very few debtors were benefited from the intervention of the Minister in terms of the conditions applicable to be qualified for the relief. This has made the situation worse, causing the burrowers to pay an additional fine imposed by the micro financing companies on the instalment not being paid on due dates besides settling the deferred instalments, thus plunging them out of the frying pan into the fire. Microfinance companies have already initiated legal action against the defaulters. Some of them have informed their debtors that legal action will be taken against them unless the outstanding amounts are not settled on time. While in Polonnaruwa, I had a chance to read a notice served on a very young married woman. She had been ordered to be present in the Commercial District Court in Colombo. The amount she had to pay was Rs. 52,000. If she failed to pay back the loan the day before the case, she is supposed to be present in the Court. She has to go from Medirigiriya to Colombo. I don’t think she had ever been to Colombo before, not even once. Now, she is compelled to go to Hulftsdorp and retain a lawyer to appear for her. She can be considered only a symbol that represents the uncertain future of hundreds and thousands of poor rural women who had been rendered destitute by their inability to pay back the loans obtained. What will happen to her? Has she got the capacity to find money to pay back the loan and resolve the problem outside a court of law, without having to face trial? If not, what would be her next step? 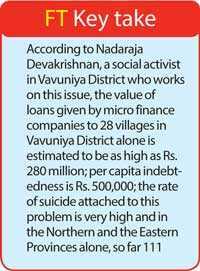 According to Nadaraja Devakrishnan, a social activist in Vavuniya District who works on this issue, the value of loans given by micro finance companies to 28 villages in Vavuniya District alone is estimated to be as high as Rs. 280 million; per capita indebtedness is Rs. 500,000; the rate of suicide attached to this problem is very high and in the Northern and the Eastern Provinces alone, so far 111 people have died by suicide. These villages where agriculture constitutes the mainstay of income are in a state of dire poverty. The plight of people who depend on paddy cultivation is worse. Though the country has given priority to paddy cultivation, income generated from paddy cultivation stands much lower than the income that could be earned by growing grass. Paddy cultivation can be considered a major factor that has affected the rural poverty of Sri Lanka. The people depending on agriculture are constantly affected by natural disasters like floods and drought, etc. In addition, the damage caused to agriculture by wild animals such as monkeys, rilavus, wild boar, peacocks, porcupines and the long-tailed ground squirrels is immense. The damage is as much as 40% of the total agricultural product of the country. This is a problem that can be solved easily. But, the government lacks the determination to do it. The micro loan problem of rural people is an additional burden on them. The present condition of farmers of Sri Lanka had dropped into a wretched and a pathetic level as had happened never before since independence. A superficial observation will show that most of the rural farmers live in tile roofed houses equipped with household furniture, electric appliances like television and refrigerators; they have vehicles such as motorcycles and three-wheelers. This gives an impression that the rural farmers are a well-to-do lot. But, the reality is that they have acquired most of these things, if not all, on loans obtained from various sources at high interest. To pay for the loan instalments and interest they have to cut down expenses on food and clothing, the basic needs of life. Most of them live in a state of partial starvation. Their level of indebtedness remains very high and has made their lives a tragedy. The present scenario of these villages can be described as a modern version of ‘The Village in the Jungle,’ the classic novel by Leonard Woolf portraying the fragile existence of poor people in a remote village. The Central Bank should mostly be held responsible for letting the micro loan problem grow to its present heights. Micro financing is a subject that comes directly under the purview of the Central Bank. Only the companies registered in the Central Bank are empowered to grant micro loans, but the majority of micro finance companies can be considered as those not registered in the Central Bank. Even the registered companies have not conformed to the law. Both the registered and nonregistered companies are engaged in a massive exploitation. The Central Bank, the Government and the political parties appear to have adopted an indifferent policy in this regard, letting these predatory plunderers exploit villages without hindrance. It may be that they are keeping aloof in the face of this crisis probably in expectation of a share of the pillage. Why are women’s organisations silent and maintaining a tacit policy on this issue? Can’t they see the damage and the destruction being caused? All of them must realise that this problem now rests on top of a live volcano. They, too, are standing on it. The day it will explode will not be long. It may erupt at any moment.